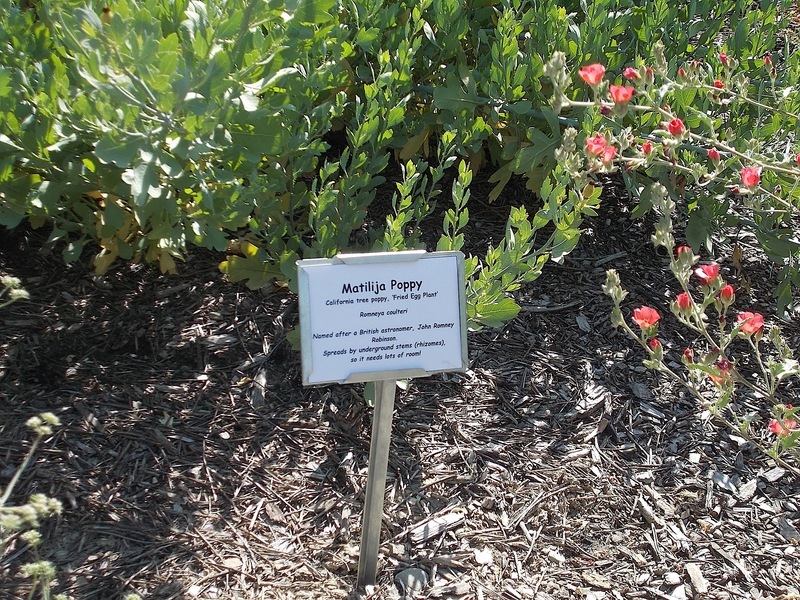 At the Granada Native Garden, we have coffeeberry, milkweed, miner’s lettuce, and even a plant that gives off the savory aroma of sauteed onions and peppers! 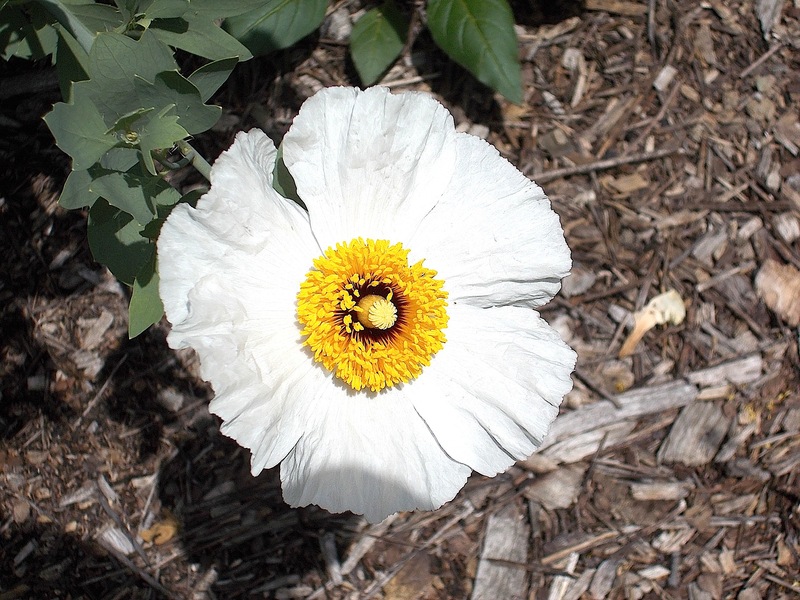 To continue the foodie theme, currently in bloom is the so-called “fried egg flower”, properly named the matilija poppy (Romneya coulteri). That’s “ma-TIL-i-ha”, by the way. And you can easily see how it gets its whimsical nickname! Or “sunny side up” flower, if you prefer? “Queen of the California Wildflowers” is another title that has been justly bestowed on the matilija poppy because, as Greg Rubin and Lucy Warren have said, “Drama is Matilija poppy’s first, last and middle name.” It is in good company with our famous California poppy, belonging to the same botanical family (Papaveraceae). The genus name “Romneya” has no relationship to a recent presidential candidate, nor even to a botanist, but rather to the Irish astronomer John Thomas Romney Robinson (1792-1882), who also happened to be the inventor of the anemometer, a device for measuring wind speed. We’re not sure how he happened to get a flower named after him, except that it might have been given to him by an admirer because of his efforts as an active organizer in the British Association for the Advancement of Science. However, even tho the matilila poppy is truly a California native which luxuriates in hot, dry weather with no water except whatever has fallen during the winter, it has apparently acquired an extensive following in England, with its wet weather, cold winds and overcast skies. Several gardeners in England report having grown it successfully there, where it is a showstopper wherever it has been successful. Hard to Start, Hard to Control The matilija poppy insists on special treatment when transplanted from a pot. Be careful not to disturb the existing roots any more than necessary. Water thoroughly once, then withhold more water for a month, or until the leaves seem to be stressed. Bert Wilson of Las Pilitas Nursery confided that he “plants three to get one successful plant”. But be careful what you ask for! 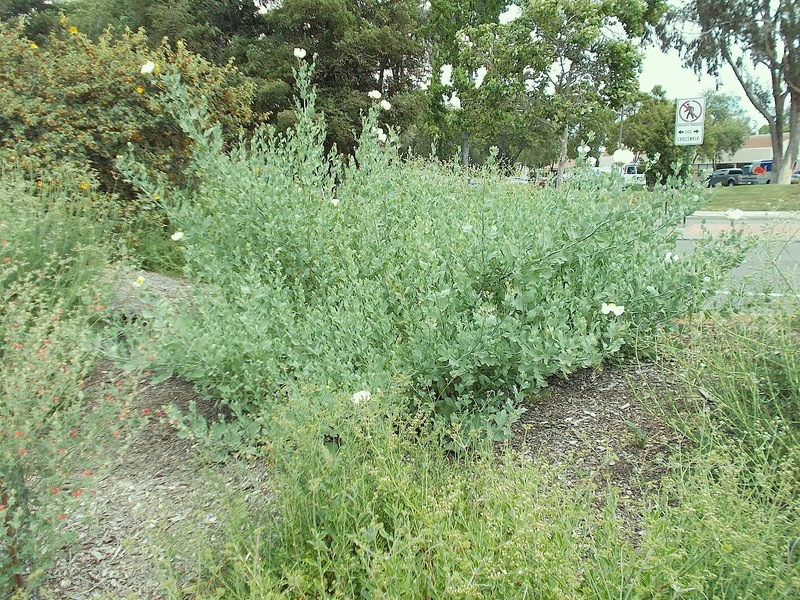 Once the matilija poppy gains a foothold, it takes over — literally. In a single season, it can reach 6-10 feet tall and just as wide. It spreads by means of underground rhizomes (plant stems that grow horizontally under or along the ground and send out new roots and shoots, which become new plants), so it will pop up all over the place. It has even been known to tunnel under a house and come up on the other side! (You can enlarge the pictures below by clicking on them.) However, this very characteristic of sending out runners can be used to control erosion on a slope. 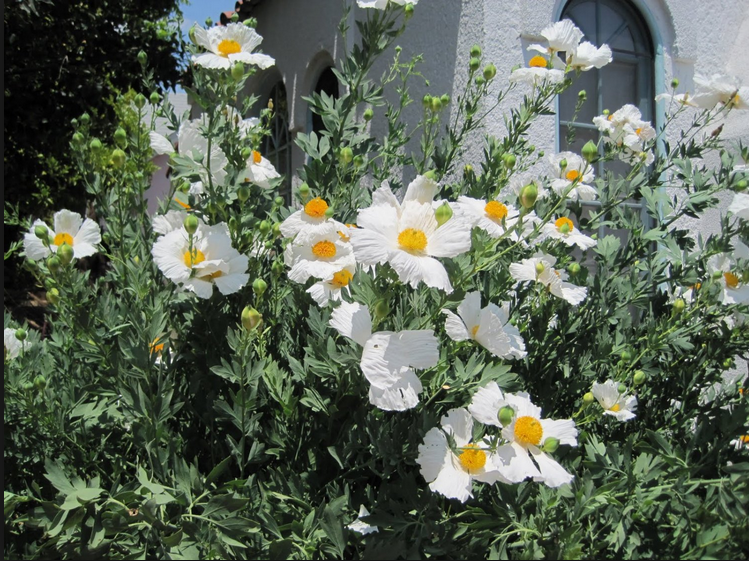 The matilija poppy usually blooms from March thru July. The flowers are said to have a faint apricot scent. After that, the plant starts to die back, and in the fall or winter it should be cut back to about 3-4 inches from the ground, except for any new shoots that have begun to appear. Winter rains will start the growth cycle all over again. 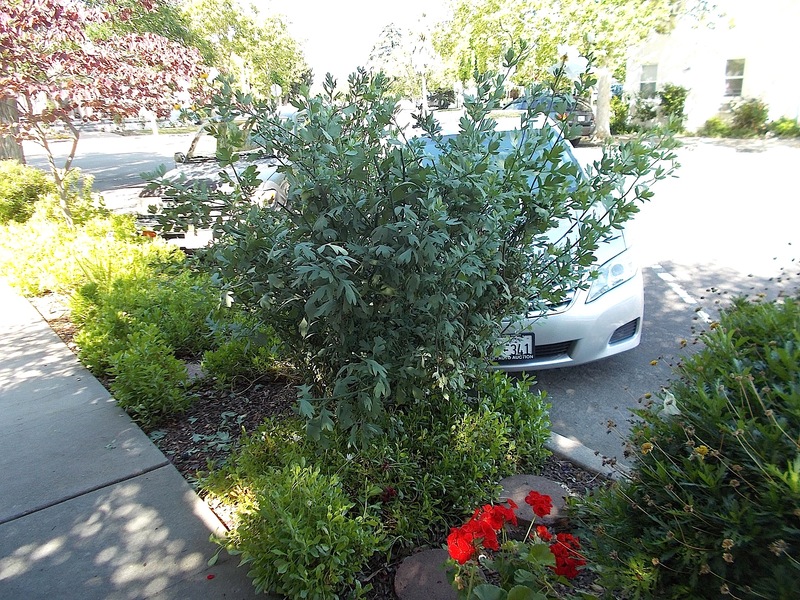 But needless to say, the matilija poppy needs its space and isn’t a good match for a small garden. 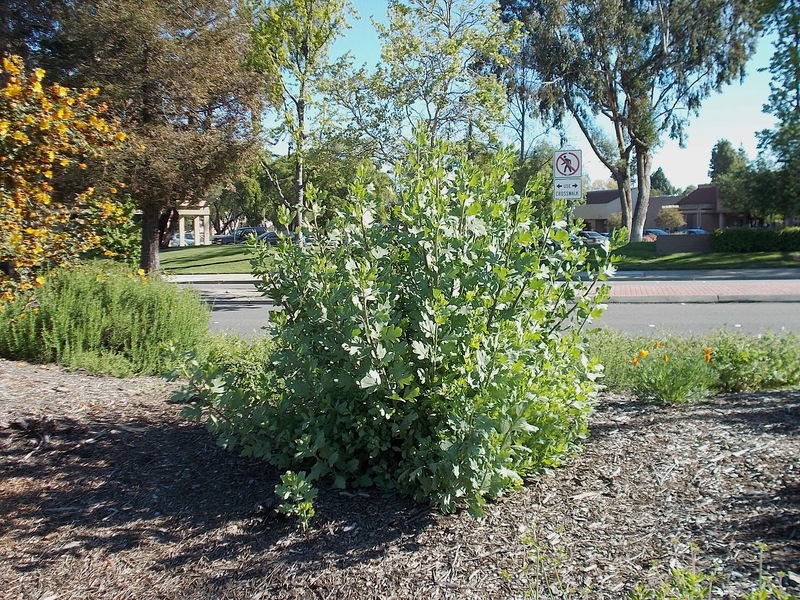 Nonetheless, this matilija poppy growing in a parking strip on Fifth Street in Livermore insists on defying the odds! GNG Seasonal Update The variably red, pink and white Clarkias are in full bloom now (that’s why they are nicknamed “Farewell-to-Spring”; see the article “Clarkia – A Native Flower with a History”, published in May, 2014), but most of the other spring wildflowers have set seed and are gradually being removed, along with the superbloom of weeds resulting from this year’s rains. During the summer, we plan to install a few secondary pathways that will allow visitors to explore more remote sections of the Garden and appreciate some of the other native plants that are off the main trails. We will also be adding a few larger plant identi-fication markers, in addition to the more informative tubular ID markers. One or more staff of the GNG are routinely on duty at the Garden on Mondays and Thursdays, roughly between 10:00 AM and 12:00 noon. But it isn’t very hard to arrange a guided visit at other times. If you are interested in scheduling a visit, just email Jim at JIMatGNG@gmail.com . Or if you have any questions or inquiries, please email Jim at the same address! Native Plants at Alden Lane Nursery As mentioned in our previous article about the “Water-Wise Buckeye”, the native plants section at Alden Lane Nursery has been relocated. 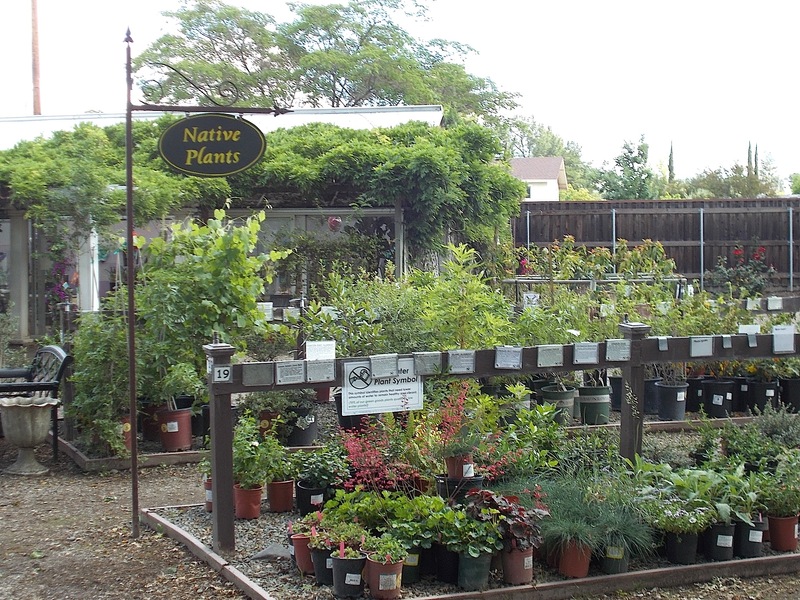 There are now two places at the nursery where you can find California native plants. 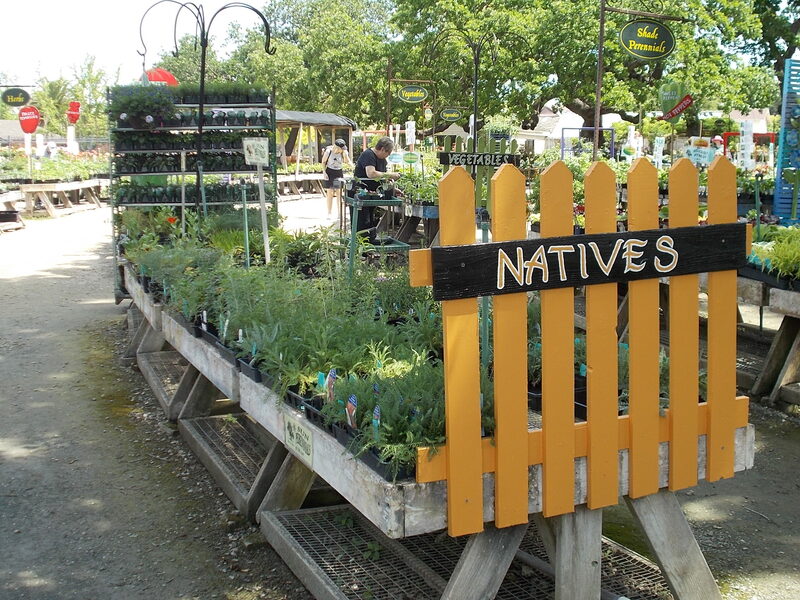 The original assortment of natives, mainly stocked with 1-gallon and larger specimens, is now at the rear of the nursery. A table containing smaller, 4-inch pots can be found in the main part of the nursery. Check both out! Quote du Jour “Do not even bother trying to contain this plant, as it always escapes. 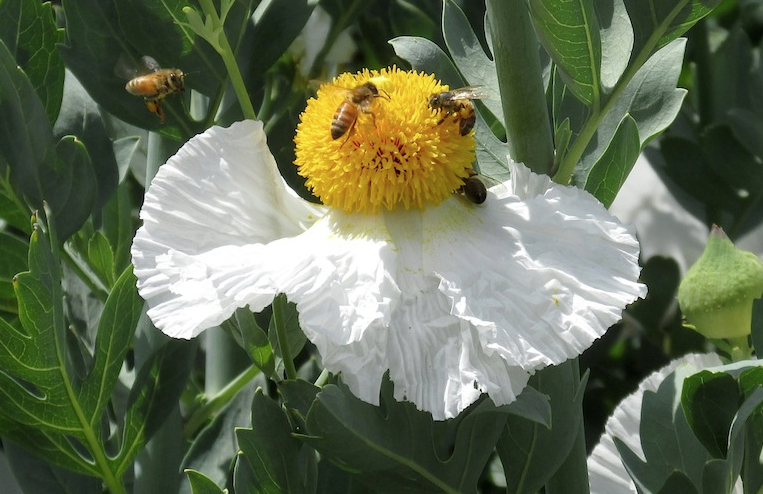 You may be forgiven when you curse the day that you invited Matilija poppy into your garden, but the plant’s flowers and foliage are so beautiful that nearly everyone eventually succumbs to its charms.” Bornstein, Fross & O’Brien, California Native Plants for the Garden, p. 172. I love these plants. So far, I have been 100% unsuccessful at propagation – I just don’t seem to have a feel for it and am too inconsistent. So, I’ll just keep buying them in 1 gallons! I’ve used them in client gardens – careful to put them in areas that make sense: the flowers show, the foliage is maintainable and they can’t overwhelm the garden space.